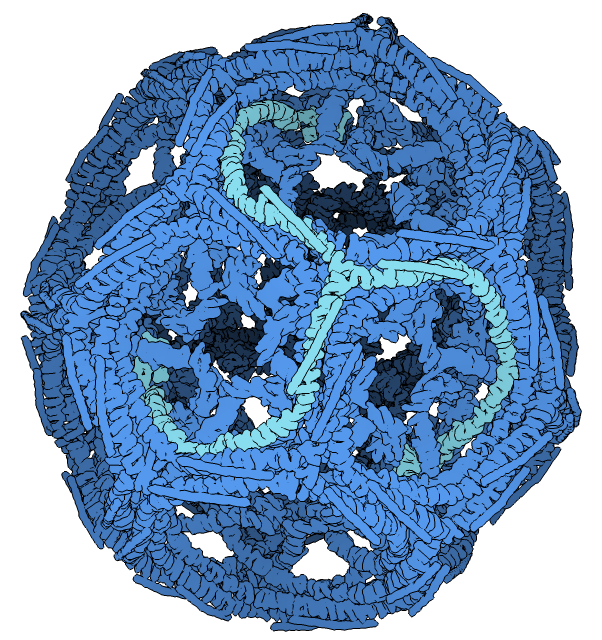 This image of a clathrin cage uses flat shading and edge highlighting. It is a copy of a PDB molecule of the month image made by Graham Johnson and Dave Goodsell. David Goodsell pioneered this visualization style. This image was made with the Multiscale Models tool, silhouette edging, depth cue color black, and surface lighting turned off. The triskelion arms are not distinct chains in the PDB model, so an edited PDB file 1xi4-arms.pdb was used. Tools / Viewing Controls / Effects, enable silhouette edges, set depth cue color black. The original Protein Data Bank model 1xi4.